One of our fab sponsors and monogram goddess, Marley Lilly, is ready for warmer temps too and has a great selection of monogrammed must-haves for your upcoming beach trips and poolside visits. 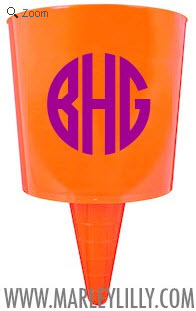 Heck, Marley Lilly is a must-have even if you're just laying out on Bowman or Lever Beach. From monogrammed bathing suit tops to beach bags to towels -- Marley Lilly has it all! 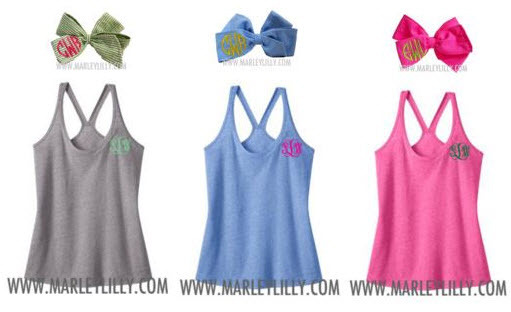 Check out these super cute and comfy monogrammed tanks with matching monogrammed hair bows! These are perfect for throwing on with shorts to run errands, wearing for a summer run, or great as a coverup to wear to the pool or beach. And the bow will be super cute while keeping your hair up and your neck cool. You could even attach the bow to the back straps of your tank to add a cute accent to the top. 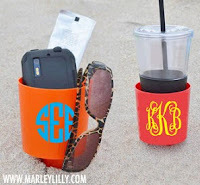 We also want to highlight one of our fave new Marley Lilly monogrammed items - the Sand Buddy. This bright colored cup sticks securely in the sand (or grass), right next to your beach chair, and can hold your drink, your phone, sunglasses, chapstick, etc. Such a simple item, but definitely a new must-have. I could even see myself using this at my Clemson tailgate next to my tailgate chair! At only $13.99, you better believe I'll be buying these for me and all of my girlfriends. Marley Lilly has generously offered to help us usher in Spring with a great giveaway. One very lucky Clemson Girl will win one of these monogrammed tanks and matching monogrammed bow in the color and monogram of their choice! Use the widget below to enter. Your email will never be shared and will only be used to contact your if you are a winner. Deadline for all entries is Sunday, April 7th at Midnight EST. You have all weekend to enter! We will draw a winner at random on Monday, April 8th, and contact the winner by email. The winner will have 48 hours to reply to the email or we will draw a new winner. Big, big Clemson Girl thanks to Marley Lilly for sponsoring such a fabulous giveaway! Good luck ladies!! They are all so cute! But I love the pink...everything pink! Love the gray and green! Anything Marley Lilly is adorable.. but my favorite tank color would have to be the pink with matching bow!! I like the blue tank and bow! I love the monogrammed tank! Blue bow and tank--so cute! What a fabulous giveaway!!! I love the pink tank and bow. I love the Gray and Green. Its so cute! I love the pink tank! And the blue!